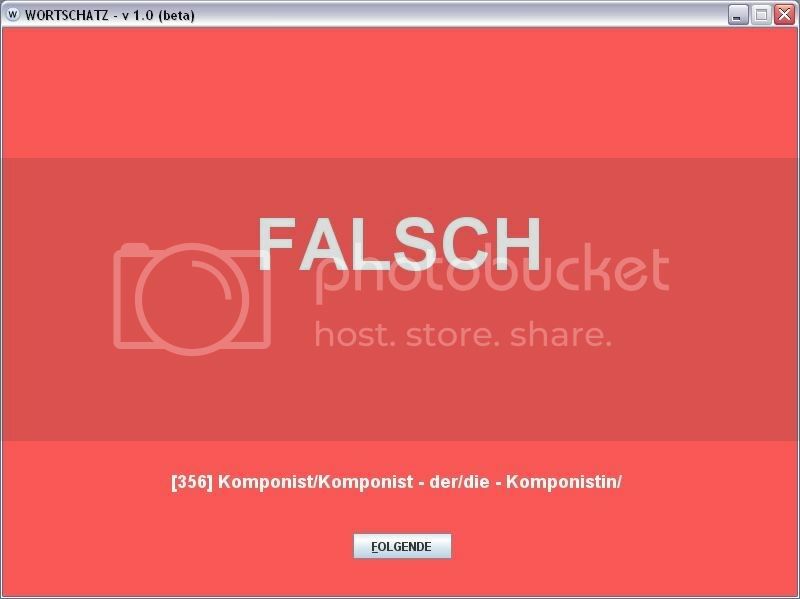 Well this a small project I made for my brother, he is learning German and he said he was feeling lazy to make study cards to learn the genres/articles, feminines and plurals of words so he asked me to program this simple application. What it does is that it randomly takes a word from a CSV file [ wortschatz_worts_db.csv ] and presents you either its plural or the word itself, then you must fill in the rest of the info and then the program tells you if you were right or wrong about it [ presenting the right answer in this later case ], then it selects another word and so on until you get tired or bored. The words can be categorized thanks to another CSV file [ wortschatz_kategories_db.csv, this one and the previous file can be manipulated (add, delete and modify entries) with Excel (or its open source equivalent) as long as it doesn't change the format when you save it, be very careful with this ], each one of the lines in that file defines a category, this category should have a code [ a sequence preferably ] to identify it and you should include this code to make a word be included in a category. 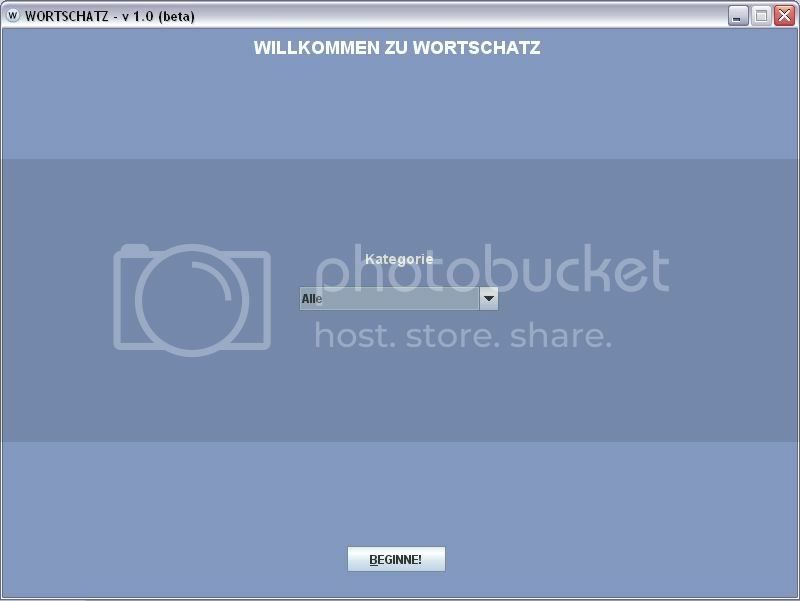 The software lets you chose at every moment if you want to work with a certain category or with all of them. The first number represents the word identifier, just a sequence or correlative [ that could be generated with Excel/Calc ], the second one is the category code, the third value is the word's article, the next one is the word itself, then there is the word's feminine [ in this case inexistent ] and finally the word's plural. 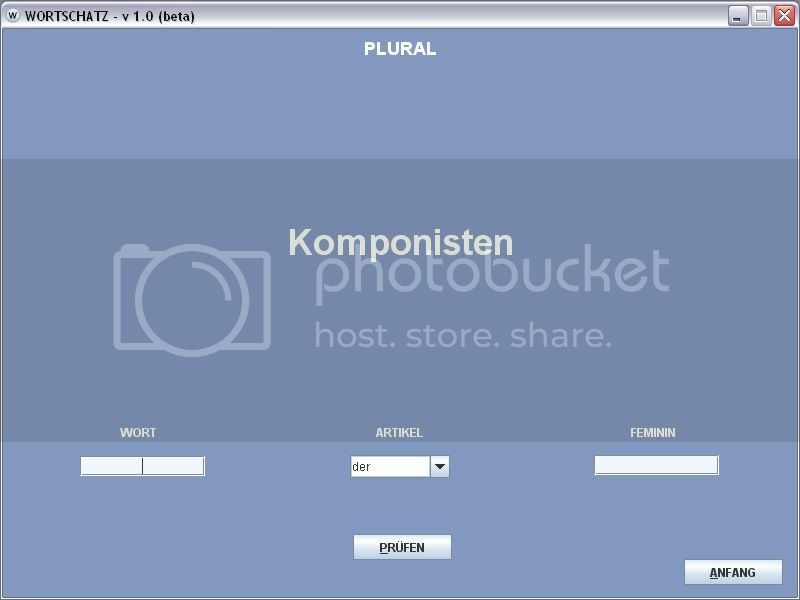 It is important to notice that the program allows words to not have feminine but doesn't allow them to not have plural, if there is any error in any of the lines of the file the program will present the "Irrtum" [ Error ] word but after you select the next word will continue to work normally [ if the next word doesn't have an error as well ]. In which the first number represents an identifier and the next value is the name of the category itself. Finally I will only make it clear that this is open source software distributed under a GPL license and thus you can modify the source and change the application at your taste [ if you know a bit of Java ], but the result of modifying the source files cannot be sold commercially [ read the included license, please ], also the license clearly explains that there is no warranty for this free software and that all modified versions of it must be marked as changed. Not many of them and not so high ones either: 64MB RAM, 700MHz processor, Java 1.6. As I've said before the software is made in Java so you will need to have the latest version of the Java Virtual Machine installed in your computer before running it, you can get it from the Java site. If you use the Windows version it will give you the option to automatically download and install the required Java for you. Oh I almost forgot, people who make open source software always say in the end: "if you find this software useful please consider donating to my paypal to buy me a beer or two"... but it happens I don't have a paypal and neither am too much of a beer fan so instead please consider donating to Save The Children, thank you.